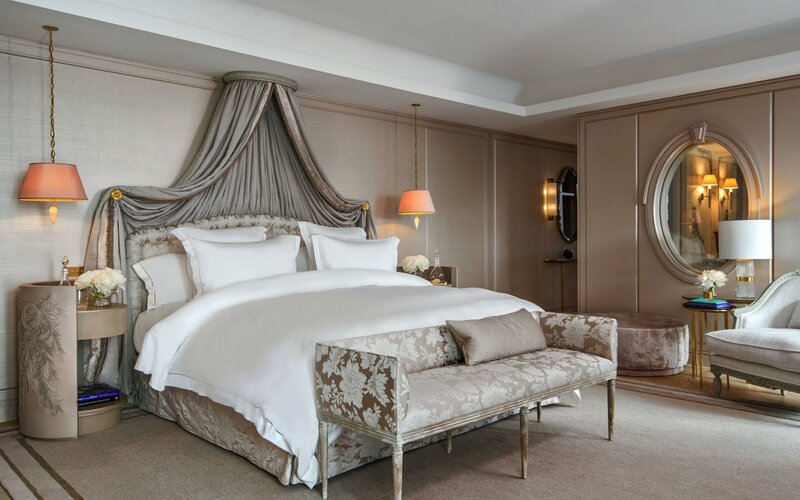 After four years of a large-scale renovation of the hotel Legend Hotel de Crillon, A Rosewood Hotel - an architectural monument of the XVIII century and one of the symbols of Paris - is once again ready to accept those who appreciate the present art de vivre. Over this process worked architect Richard Martinet, interior designers Tristan CPM Shahan Minassian, Cyril Vernol and Aline Asmar d'Amman. Two suites «Les Grands Appartements»overlooking the Place de la Concorde issued maestro Karl Lagerfeld, a big fan of the XVIII century, often referring to it in the collections of Chanel . A bizarre landscape around the hotel is in the best tradition of French landscape parks was designed by Louis Benes. The rooms and suites special attention was paid to the tissues, moldings, sculpture and design detail, emphasizing belonging to a certain era. The interiors are used 600 different materials, including 40 kinds of marble, all the furniture is made to order, antique accessories, art objects and books are selected in accordance with the style of each room. In addition to the suite of Marie Antoinette, in the Hotel de Crillon has a suite dedicated to Louis XV, with lots of mirrors - including the doors; suite dedicated to Louis Bernstein, with a dining room for six people and, of course, the Duc de Crillon Suite with furnishings that belonged to his family. 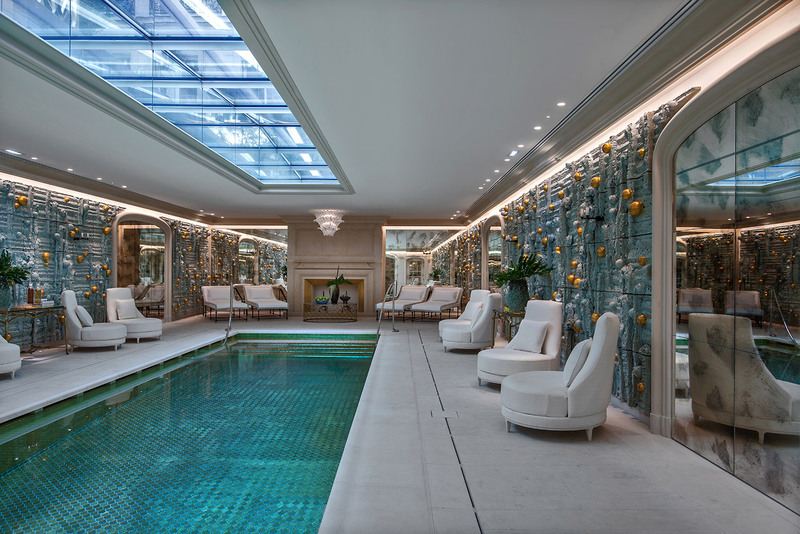 In this situation, in gardens and elegant furniture, saloons and restaurants, there is a space for rest and relaxation - spa, Rosewood with a swimming pool, which is paved with gold scales simulating tiles and ceramics decorated with a fresco of Peter Lane. Spa Rosewood offer the most modern treatments, but in the entourage of the French court. You can come to the Shiatsu massage or procedure the Jet-Peel , but before the start of the session you will be given a French brand fan Duvelleroy of perfumed silk jacquard and a pear tree, and at the end of the old sprayer Marcel Frank you sprayed a fragrant silky powder. Without special offers Hotel de Crillon would not be an example of old-fashioned courtesy. The unique spa for shoes that are opened studio Devoidecourt , working on site gentlemen only . Shoes are treated with creams on the basis of brandy, a favorite bag, purse and travel bag back to life by any means. In the wizard, you can be sure: all of them - with a wealth of experience working with elite products and higher quality materials. I must admit that the hotel's location in the heart of the city and the views from the terraces - the Eiffel Tower and the Place de la Concorde - already make it special. But the stylistic solutions that act as a time machine, and premium services to make it a true symbol of Paris - on a par with the Louvre, the River Seine and the Arc de Triomphe.